My oldest caught his first fish this week. While for many kids this wouldn't be a big deal, for him it's huge. He has never been a child that has excelled at sports. Over the years he has tried t-ball, tennis and swimming. They all ended quickly when he realized that he was not going to be a sports star. I was so ecstatic when my mother-in-law called and informed me that he had caught a ten inch bass, by himself. Of course now he has made my in-laws buy him a new fishing pole and buy fishing licenses. I'm just happy that he has actually found something that he enjoys and is good at. Since my oldest is at my in-laws fishing up a storm, my youngest and I have been left to ourselves for meals. During the week I am a big fan of healthy breakfasts that I can get on the table quickly. This week I tried a new recipe for Overnight Oatmeal from the Food Network. This recipe has 5 ingredients. It takes a total time of 9 hours 10 minutes, 10 minutes of which is active and makes 4 servings. I did make significant changes to the original recipe. I ended up making the recipe twice, once as written and once with large changes. The first batch of oatmeal was too strong on the fruit, it almost tasted like a warmed fruit dish instead of steel cut oats. For the second batch I left out the dried food completely. Instead, I used 1/4 cup of pure maple syrup and 2 teaspoons pure vanilla extract. I followed the same amounts of half-and-half, water and steel cut oats as the original recipe. After I portioned the servings into bowls I added additional non-fat half-and-half. My oldest and I are fans of thinner oatmeal so this step allowed for the desired texture. Putting the ingredients in the crock-pot the night before made for a very easy breakfast. The original recipe was too heavy on the fruit, but with my changes the oatmeal was perfect. If you aren't a fan of sweet oatmeal, you could try almonds, pecans or walnuts. Cinnamon or nutmeg would also work for flavor. For the recipe go Overnight Oatmeal. I love it sweet to :) You can add more maple syrup to the individual servings if you want it even sweeter. I look forward to hearing how it worked! That's awesome about catching his first fish. Congrats. My mother in law cooked it for him and he ate the whole thing :) The boy is obsessed with fishing now! This summer I am making an effort at using mostly my crockpot. This sounds like a neat idea to try. I have definitely not had oatmeal in a slow cooker but I'm definitely up for trying this.....anything that makes my life easier. We are looking for summer breakfast ideas in this house. This looks like a winner! Since my oldest is home during the day in the summer I am always trying new breakfast ideas too. This one is nice since it can be prepped the night before. I have never seen this idea before so I am very excited. I love my slowcooker but for some reason I never thought of it as something I could use for breakfast. I am going to try this very soon. Tried the Cucumber/Mint recipe the other day and it was a huge hit in this house. Keep them coming! Slowcookers are great for so many things. They make delicious rice pudding and brownies too! When you try the recipe tell me how it works out, the cucumber/mint recipe was delicious I agree. Especially in the summer when the weather gets so warm! We do this all the time! I love to do it the night before a holiday, like Easter or Thanksgiving, so I have an easy breakfast ready to go while I get started on the feasts for later in the day. I always try to pre-prep my holiday breakfasts also. My favorite is my mom's strata recipe, so yummy! I remember catching my first fish. After that I was hooked on fishing. Growing up on Long Island we had so many spots for freshwater and saltwater fishing. Still love it! We are lucky to have a lot of fishing spots too. He definitely seems to be hooked! Your son sounds like mine... he is now 14 and has found fishing and participating in Boys Scouts to be the most fulfilling recreation for him.. Thank you for the overnight oatmeal recipe. I love steel cut and hardly ever make it because it is time consuming. Pinned the recipe. Thanks for coming to foodie friday. 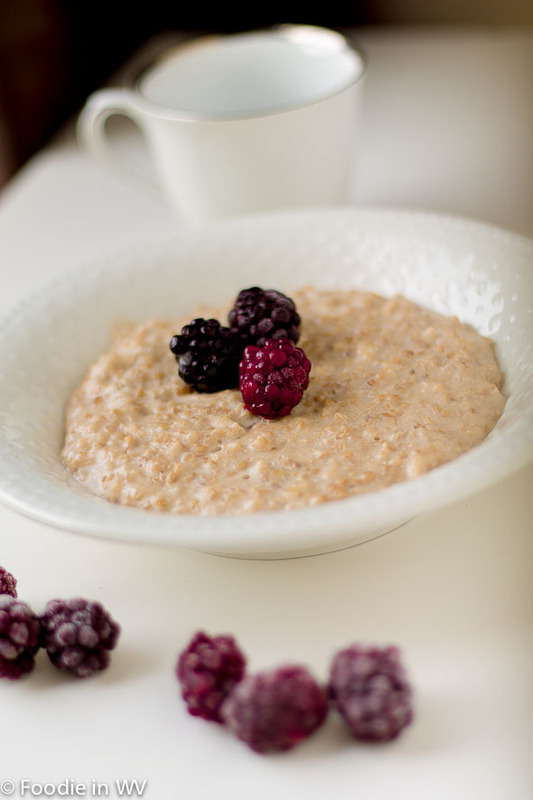 I did have an article on my review of their slowcooker recipe :) I love oatmeal too, it's a great way to start the day! That is AWESOME. I've had a few of my handbags in Haute Handbag magazine. It's time consuming submitting to a magazine. I had to actually send them the handbags also. I didn't make the May 15th deadline so I won't have a bag in the October issue. They took 2 out of the 3 bags. It's work! I was lucky that they approached me about the review. It's a new section that they are starting and I was happy to be the first person mentioned :) I wish I was talented and could make handbags or sew. My mother was a beautiful seamtress, but it seemed to have skipped over me! I know how to sew, just not like my mother did. That's awesome that you will be in the magazine!!! Breakfast is the meal I struggle with the most too :) It's easier if I can prep something ahead, if I have to think of something to eat I often end up eating nothing!